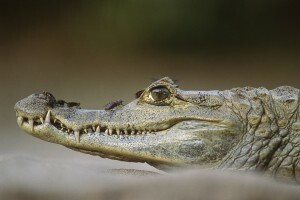 Spectacled caimans are the most frequent crocodiles in South America. They reach a length of 2- max. 3m, are coloured olive-green and have green eyes, which are reflecting reddish from the spotlight during the night. During the day, caimans are often taking a sunbath on river-shores or sandbanks. Their food consists before all in different sorts of fish, the young are also hunting freshwater-crabs and insects. In some areas caimans are already extinct, as they are hunted because of their meet and their skin.